e-Campaign can send emails via an external SMTP server, or its built-in SMTP server. 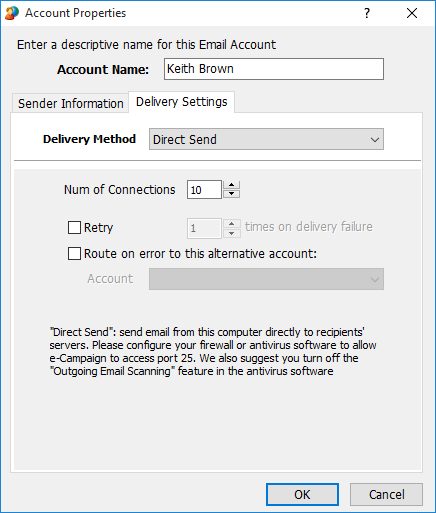 Direct Send refers to e-Campaign sending emails via its built-in SMTP server and delivering emails directly to recipients' mailboxes, bypassing your ISP's or company's SMTP servers. Note: if your ISP(or firewall) blocks TCP port 25, "Direct Send" won't work. An SMTP account is used for outgoing emails. If you have other email software installed, such as Microsoft Outlook, Outlook Express, Mozilla ThunderBird, or Eudora, chances are that you already have an SMTP account. To import SMTP settings from your existing email software, click menu “Edit->Import SMTP Settings From”. If you don’t know what SMTP account to use, please contact your mail server administrator, and request an SMTP account for sending email. Please turn off the "Outgoing Email Scanning" feature in your antivirus/firewall software, and configure the antivirus software not to block e-Campaign from sending email (or accessing port 25). To see why emails failed, click the Delivery Log tab on the Main window. Some mail servers now have aggressive anti-spam policies, and reject "Direct Send". We recommend you send email via an SMTP server. 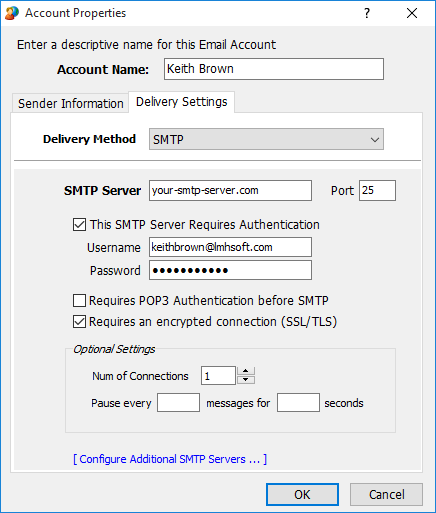 You can use the same SMTP info as in Outlook/Outlook Express. To import SMTP settings from your existing email software, click menu Tools->Email Accounts, then click the Import button. If you don’t know what SMTP account to use, please contact your mail server administrator, and request an SMTP account for sending email. Refer to the section below How do I diagnose email sending problems? 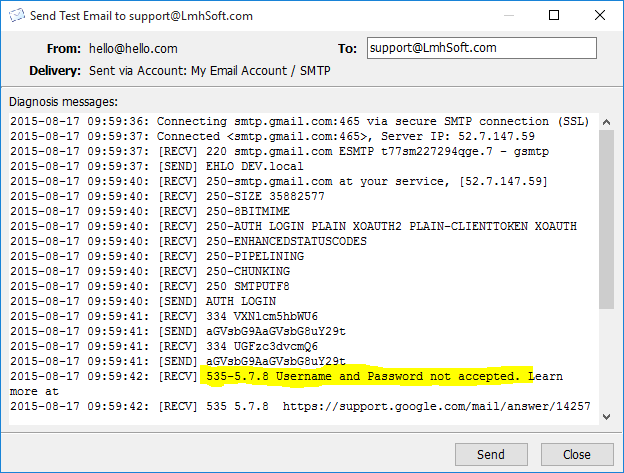 If you see something like "535 Incorrect authentication data" or "535 Authentication failed in the above window, it indicates the SMTP username/password is wrong. And you need to re-specify a different(correct) SMTP username/password. If you see [RECV] 250 ... Message accepted for delivery, it means the message is successfully delivered to and accepted by your server. Please verify that your firewall/antivirus software allows e-Campaign to access the Internet and TCP port 25. Also, we suggest you disable the "Scan outgoing email" option. -Under Ports to Block uncheck "Prevent Mass Mailing Worms from sending mail (PORT 25)"